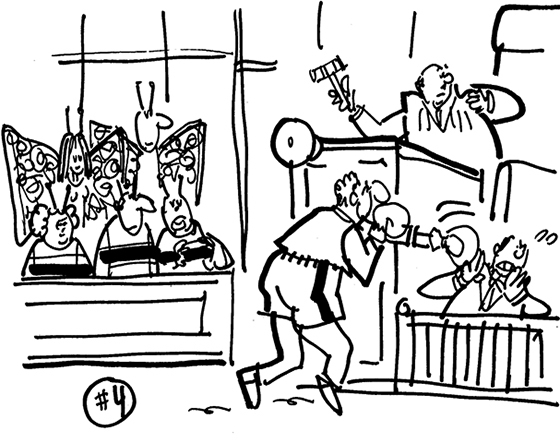 Inside Counsel Magazine has a monthly humor feature called Strange Suits: brief summaries of four unusual lawsuits, and a cartoon about one of them. They send me the descriptions, I sketch out ideas for each, they pick the one they like best. 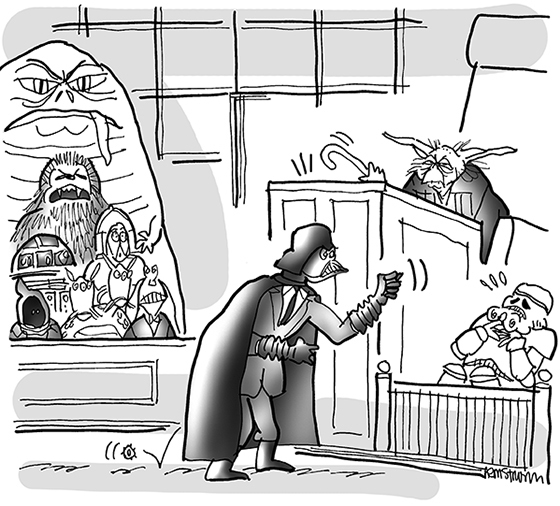 Most recent winner: George Lucas challenged a United Kingdom court ruling that allowed the sale of replicas of the Stormtrooper helmets featured in his Star Wars films. Surprisingly, the U.K. Supreme Court rejected the challenge, ruling that the helmets were props, not sculptures. In the U.K., props only have copyright protection for 15 years. “Sculptures” have protection for 70 years. Scroll down to see the rough sketches for the suits that weren’t selected. Former Chicago Bulls basketball player Scottie Pippen decided to invest in a personal airplane. He named his company Air Pip. He lost millions, and the failed venture resulted in multiple lawsuits. In August, a Miami court awarded Pippin more than $2 million in a case involving a former business partner. An Italian immigrant is suing tv celebrity chef Lidia Bastianich for $5 million. The plaintiff, also a chef, alleges that Bastianich lured her to America with promises that she’d be working alongside Bastianich. Instead, the woman claims she was forced to work, without pay, as a 24/7 home attendant for Bastianich’s elderly neighbor. Boxing legend Muhammad Ali is suing Kobo Inc., a Canadian company which makes and sells the eReader, an e-book reader similar to Amazon’s Kindle. The suit alleges that Kobo used Ali’s famous slogan “float like a butterfly, sting like a bee” in a print ad for the eReader without permission. It claims the slogan is a registered trademark that Muhammad Ali Enterprises licenses to third parties. 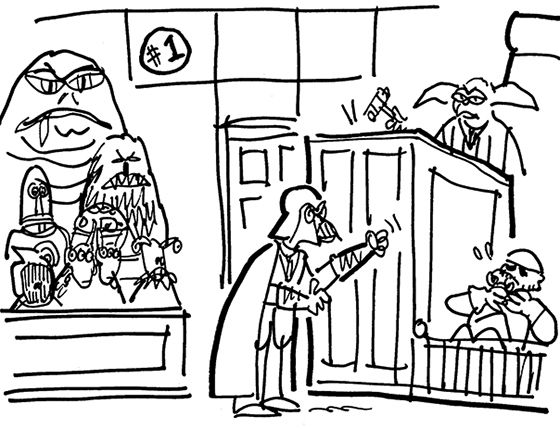 And here’s the original rough sketch for the Star Wars lawsuit. What do you think? Did you have a favorite? Do you enjoy weird lawsuits? Hate ’em? Love ’em and hate ’em?? Hope you’ll leave a comment. And if you enjoyed this post, I invite you to subscribe. Just click on the Subscribe button below the Portfolio Thumbnails in the sidebar at the top right of this page. Some of the wierd cases are far-out. I was a law librarian for over 7 yrs., so I can relate to the law world culture. Also the judges’ world, since 1 of my job’s was working for a judges’ library. *A power failure through the whole of downtown Toronto. I was working inside the courthouse. 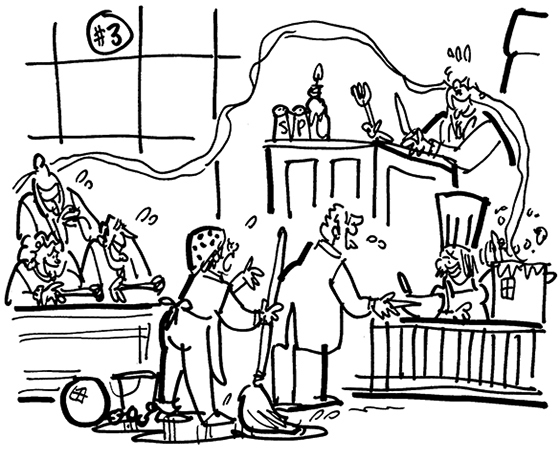 The 3 judges hearing a case….did not evacuate the building. They continued to hear the case! 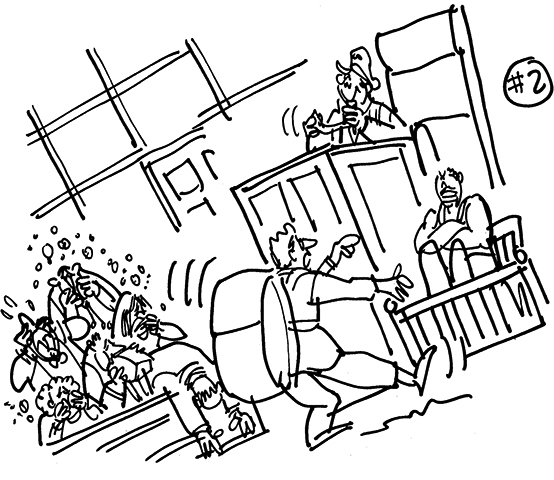 *Or the story of 1 judge our library served, who asked a lawyer to leave, who was presenting her case in court. Because her orange suit was too bright for him. Anyway….it’s a whole legal world unto itself! Always a pleasure, Jean, good to see you. Loved your anecdotes. The one about the lawyer who got the heave-ho for wearing the orange suit really made me laugh. If she ever wears it for a bicycle ride, she won’t have to worry about being visible to motorists!! Many thanks for stopping by. And now I can laugh loud…. Ah– you’ve taken exactly the right tack. It’s always best to approach these things slowly, let the mirth build up, and then simply roar with laughter!! Yoda: It’s guilty you are.